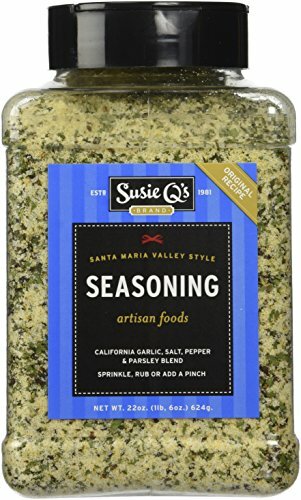 A uniquely versatile seasoning blend that hasn't changed since it was launched in 1981. An essential seasoning for those whose passion is regional cooking, as well as a pantry staple that magically transforms all foods into savory dishes. Meats, fish, eggs, vegetables, pastas, soups, sauces, breads, popcorn, cottage cheese, sour cream, cream cheese and butter are some of the foods that are enhanced by this seasoning. Use as a sprinkle or finishing salt, a dry rub for grilling or add a pinch to favorite recipes for incredible results. It is a well-balanced blend that rounds out on the palate without being salty or strong flavored. Add a pinch to your favorite recipes for incredible results. If you have any questions about this product by Susie Q's, contact us by completing and submitting the form below. If you are looking for a specif part number, please include it with your message.